Atop the piano you will find one of our favorite skeleton friends, Jack Skellington. He takes the place of honor above the focal point in this room. Notice he is encircled with more of that awesome black garland. Creative inspiration comes from anywhere. This year, I happened across several ideas on random blogs linked through other blogs. I stumbled upon this blog and instantly fell in love with the candy corn candles. Since we had about 12 pounds of candy corn sitting in my living room (thank you Jordan & Stephanie's wedding reception!) 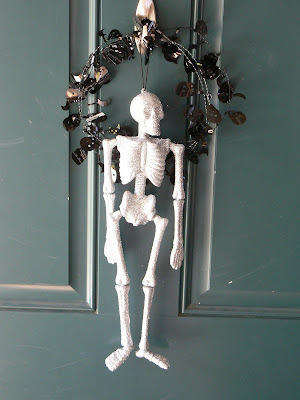 I figured it would be an inexpensive and super cute decorating item. Come into the kitchen and see the fall festival above our cabinets. Mr. Jack-o-lantern is peeking out from the other pumpkins in the patch. And finally, the piece de resistance, my favorite little vingette this year, hiding behind glass in the TV cabinet, the skull with spooky clock and melting candle. I don't know what it is, but the skulls and skeletons are speaking to me this year. Maybe they're speaking to you too? Happy Halloween decorating! Love it all, especially the pumpkins, skeletons and melty candle.